In the text, the icon is a link to the definition of the word it marks. Use your browser's "back" button to return to the page. Battle of Chickamauga--Sept. 19' & 20' 1863. After the Tullahoma Campaign, Union Major General William S. Rosecrans renewed his offensive, aiming to force the Confederates out of Chattanooga. The three army corps comprising Rosecrans' army split and set out for Chattanooga by separate routes. In early September, Rosecrans consolidated his forces scattered in Tennessee and Georgia and forced Confederate General Braxton Bragg's army out of Chattanooga, heading south. The Union troops followed it and brushed with it at Davis' Cross Roads. Bragg was determined to reoccupy Chattanooga and decided to meet a part of Rosecrans' army, defeat them, and then move back into the city. On the 17th he headed north, intending to meet and beat the U.S. XXI Army Corps. On the morning of the 18th three Confederate brigades of Lt. General James Longstreet's corps arrived, under General John B. Hood's command. As Bragg marched north, his cavalry and infantry fought with Union cavalry and mounted infantry. On the morning of September 19, 1863, fighting began in earnest, and Bragg's men hammered but did not break the Union line. This brought on an all-day battle in which neither side gained any decided advantage. Union Major General George H. Thomas's Initial Battle Line. During the night the two opposing forces further rearranged their dispositions in the difficult terrain. Rosecrans prepared defensive positions, and Bragg planned an attack. Longstreet arrived during the night with two more brigades and was given command of the left wing of Bragg's army. On September 20, 1863, Bragg continued his assault on the Union line on the left. About 9:30 a.m., Confederates under Lt. Gen. Leonidas Polk attacked Union Major Gen. George H. Thomas corps causing Rosecrans to shift troops to Thomas's aid. Shortly before 11 a.m., Rosecrans was informed that he had a gap in his line. Rosecrans's misunderstanding as to the true location of his units led him to strengthen the defenses on his right while Thomas held the other flank . Thinking that Brig. Gen. Thomas J. Wood was on Maj. Gen. Joseph J. Reynolds's right flank, he ordered Wood "to close up and support Reynolds." Actually, Brig. Gen. John M. Brannan was on Wood's left, not Reynolds, and following his instructions, Wood pulled out of the line, and fell in on Reynolds's flank. In moving units to shore up the supposed gap, Rosencrans had created one. Apparently by coincidence, Longstreet hit the precise point left open by the Federals, crossing over the field by the Brotherton cabin and driving one-third of the Union army, including Rosecrans himself, from the battle. 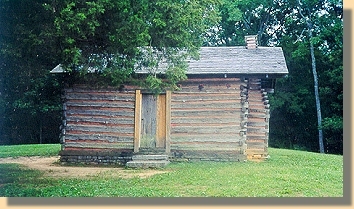 The Brotherton Cabin, pictured above, is a post war structure next to the wartime site. 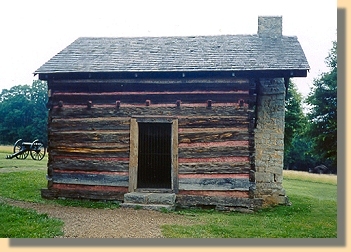 At the time of the battle of Chickamauga, George and Mary Brotherton and their children lived in a log house at this location. In the surrounding fields they grazed cattle and grew corn and hay. 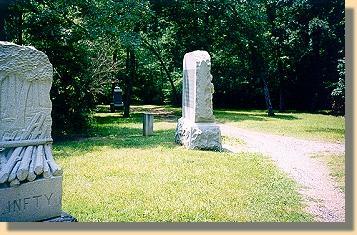 To escape the battle, some of the Brothertons and other local families took refuge in a ravine about a mile from here. There they endured hunger and cold, and prayed for their boys serving in the Confederate army. Tom Brotherton, one of the sons, played a key role in the battle. Because Tom "knew every pig trail through these woods," General Longstreet, commander of the Confederate left wing, employed him as a scout. Tom served with pride, telling his brother Jim, "It's a sorry lad that won't fight for his own home." Jim Brotherton also fought for the South. After the battle, Adaline Brotherton, the youngest daughter, returned to the cabin in search of food. Finding four or their cows who had miraculously survived the battle, she prepared milk for the refugee families. However, the hundreds of wounded Union and Confederate soldiers she saw there aroused her sympathy, and she gave the milk to them. The National Park Service Sign at the Brotherton Cabin contains a photograph of the Union Field Hospital at Savages Station, Virginia, a result of the June 27, 1862 Gaines Mill battle. As a result of Longstreet's breakthrough, Major General William S. Rosecrans, Maj. Gen. Alexander McCook, and Maj. Gen. Thomas L. Crittenden fled to Chattanooga, thinking the entire army was being destroyed. However, Union Maj. Gen. George H. Thomas, "The Rock of Chickamauga", and his troops remained and held at Snodgrass Field until after dark. Then, on orders from Rosecrans, they withdrew. The Union retired to Chattanooga while the Confederates encircled them by occupying the surrounding heights. (Source: Various, including The National Park Service, and "The Civil War Dictionary", by Mark M. Boatner III). C.S.A. Brigadier General Benjamin H. Helm, the brother-in-law of President Abraham Lincoln was mortally wounded on the morning of September 20, 1863. Helm had been leading his Kentuckians against the Union breastworks when a bullet pierced his right side. He died that night. President Lincoln had offered Helms, a West Point graduate, a commission in the Union Army, but Helm joined the Confederate Army instead. When President Lincoln learned his favored brother-in-law had been killed at Chickamauga, he was visibly stricken. It is said that Helm's death hurt Lincoln as much as the death of his son Willie, stricken with fever in 1862.